Fortnite's "primarily" co-op gameplay may necessitate a constant connection. Since it was first popularized by Ubisoft way back in 2010, so-called 'always-on' DRM has been a major point of contention in the industry. Ubisoft thought it was a success in terms of keeping down piracy, but the fact that a game was unplayable if your - or Ubisoft's - connection was down earned a lot of ire from fans. More recently, Blizzard required a constant connection to play its megahit Diablo III, with unfortunate complications to say the least. 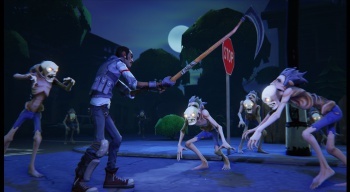 Now it's possible that Epic Games' new PC tower defense game Fortnite will be the next game to require a constant connection, but the final decision will have more to do with the game's co-op gameplay than with a fear of pirates. Speaking to Rock, Paper, Shotgun in an interview, Epic Producer Tanya Jessen revealed that the upcoming game will be "developed as a co-op experience primarily." So, while the studio has not ruled out requiring a constant connection to play, it wants to do what's "more relevant to the most fun experience you can have with your friends." It will also depend on factors outside the game, like the frequent updates Epic alluded to at San-Diego Comic-Con last weekend. An always-online connection required for gameplay makes more sense for multiplayer-focused games, but it still leaves players with a choppy or even non-existent connection out in the cold. Requiring a connection to an external server could also mean a premature death for the game if Epic decides to cut support without an offline-enabling patch. Jessen gave no indication of when Epic would decide whether or not to require a constant connection.